Democratic presidential candidate Sen. Bernie Sanders, I-Vt., speaks during a campaign rally Sunday in Oklahoma City. To understand how Bernie Sanders' presidential campaign is reacting to the candidate's gigantic loss in South Carolina's Democratic primary, it's important to understand how he reacted to another loss just a few weeks ago, in Iowa. The two results couldn't be more different. Sanders' performance in Iowa could be considered a virtual tie with Hillary Clinton, and he called it just that. Clinton won the Democratic caucuses by less than half a percentage point. That night, on a chartered jet from Des Moines to New Hampshire — just after what felt like a victory speech — campaign staffers popped bottles of champagne during the flight. Sanders, in an extremely good mood, came back and talked with members of the traveling press. Team Bernie was having a great night. Flash forward to South Carolina. Sanders didn't even hold events in the state on the day of the vote. 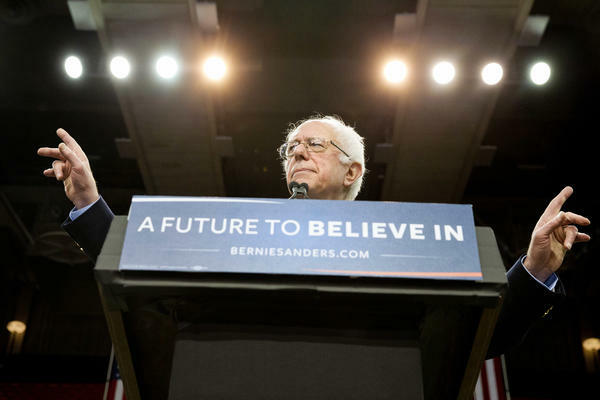 Instead, he held rallies in Dallas and Austin, Texas; and Rochester, Minn. After the Dallas events, before the Sanders campaign took flight for Minnesota, the results were beginning to trickle in. There would be no champagne on the plane. There would be no friendly gaggles with the press. By the time Sanders' plane landed in Minnesota, the results were clear and definite. Sanders had lost South Carolina, badly. On the tarmac, he told the press, "In politics, on a given night, sometimes you win, sometimes you lose. Tonight we lost." At his Rochester rally that Saturday night, Sanders seemed much less energetic than he did in Texas. The mood was more somber; this wasn't a party. Sanders didn't mention South Carolina or his disappointing finish there, not even once. And that's how it has been since the weekend. At events in Oklahoma City and Ft. Collins, Colo., on Sunday, if you listened only to Sanders' stump speech, you'd think South Carolina had never happened. It was a stark contrast to the candidate's post-Iowa stumping, where he took care to mention that that state and his results there had helped him start a "political revolution." Instead, Sanders continued to run through the list of his progressive policy goals, including universal health care, a higher minimum wage and major investments in infrastructure. But Sanders also hit hard on his opponent, Hillary Clinton. He critiqued her vote for the Iraq War and spent a few minutes hounding her for paid speeches she gave to Wall Street employees. "She has a superPAC, actually more than one," he said during a speech in Oklahoma City. "And Secretary Clinton has given some speeches to Wall Street where she's paid over $200,000 a speech." "If you're going to get paid $200,000 for a speech," he said, it "must be a pretty damn good speech. And if it's such a good speech, you've got to release the transcripts." The crowd went wild, and he kept giving them what they wanted. "In fact I can't wait to see it. It has to be an unbelievably great speech." Toward the end of his stump speeches, Sanders looks forward to the general election. "I'm going to need your help to win the Democratic nomination," he told the crowd in Oklahoma City. "And I'm going to need your help to win the general election. And there would be nothing that would give me more pleasure than to defeat Donald Trump." "We will defeat Mr. Trump," he told the crowd, "because the American people do not want a president who insults Mexicans, who insults Muslims, women, African-Americans. Who insults veterans, and basically anybody who does not look or be like him." He said of people who like Trump because of his candor, "Bigotry is not telling it like it is." Sanders said most polls show him winning in a head-to-head matchup against Trump. But if Sanders is convinced he can win a general election, he's failed to tell crowds that he's sure he'll make it to one. In his most recent stump speeches, Sanders has taken to asking voters in states like Oklahoma, Colorado and Minnesota for their "help" to "do well on Super Tuesday." But he does not say whether he thinks he'll come out on top or even if he thinks he'll win the particular state he's campaigning in. In the audience in Oklahoma City, voter Keith Sharp said regardless of Sanders' loss in South Carolina, he's optimistic. "I'm not really worried about it," he told NPR. "I think people are going to come around to him. I'm thinking he's going to do good things." Supporter Mary Stacey said she was still dumbfounded by the numbers in South Carolina, even though she says she's "cautiously optimistic" about Sanders' chances on Super Tuesday. "I don't understand it," she told NPR, of Sanders' failure to capture even a third of the black vote in South Carolina, "because Bernie has done so much more for civil rights. I mean, he was there. I can only attribute it to loyalty, that African-Americans feel loyal to Hillary. But I think if they gave Bernie a chance, they would see that he's more progressive on the issues that are more important to them." Several people who spoke with NPR at multiple campaign events didn't seem focused on Sanders' loss in South Carolina or the increasingly difficult path ahead for him. In Oklahoma City, Sanders ended his stump speech as he usually does: with a call for political revolution. "On Tuesday, Oklahoma can play a very important role in moving this country forward toward a political revolution," he told the crowd. "Let's do it." It was a slightly different line for Sanders, who in previous speeches seemed to imply that that political revolution had already begun. Perhaps the candidate, in a small way, was tempering expectations. Nevertheless, his closing lines got the same wild applause they always do. Supporters may have been there for a revolution, but they were also there to celebrate its leader, win or lose.